The Pinot Grigio Ramato by Le Vigne di Zamò is made from pure Pinot Grigio grapes, picked and selected by hand during the first two weeks of September. Aged for around 6 months in large oak barrels before bottling. Pleasant aroma of bread and yeast. Warm, ample and sapid. Perfect to match with fish dishes. 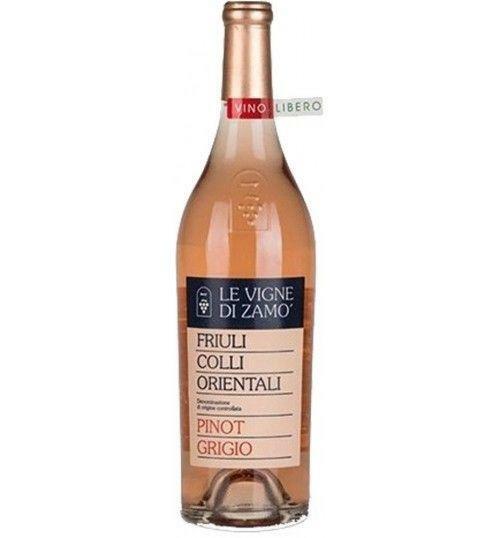 THE WINE The Pinot Grigio Ramato by Le Vigne di Zamò is made from pure Pinot Grigio grapes, picked and selected by hand during the first two weeks of September. Aged for around 6 months in large oak barrels before bottling. Pleasant aroma of bread and yeast. Warm, ample and sapid. Perfect to match with fish dishes. 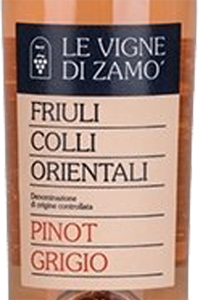 THE COMPANY Le Vigne di Zamò , a winery founded in 1978 in Rosazzo, in the province of Udine, has been a reference for thirty years not only for the large area of ​​the Colli Orientali del Friuli but also for the entire region. Its wines, always characterized by an elegance and a unique material, have amply demonstrated the greatness of the area and that of some of its best vineyards. Just think of plots now entered in the collective imagination, such as Rocca Bernarda, 10 hectares enjoying the influence of the sea and especially of large temperature changes between day and night, Buttrio, 5 hectares from which two of the most significant wines of Le Vigne di Zamò, the "Fifty years" or Rosazzo, 15 hectares characterized by a unique microclimate, fresh but at the same time temperate. Wines in perfect balance between tradition and modernity, produced in a suggestive cellar like few others, modern and buried in the hill so as not to impact the extraordinary environment that surrounds it. Before 18,75 € tax incl. Tasting Color: Intense straw yellow Scent: fruity notes and floral notes. Traces of apple apple, acacia, citrus, trace of sapidity. Taste: balanced, fresh and fulfilling, great persistence. Service temperature 8° - 10° C.
Le Vigne di Zamò, a winery founded in 1978 in Rosazzo, in the province of Udine, has been a reference for thirty years not only for the large area of ​​the Colli Orientali del Friuli but also for the entire region. Its wines, always characterized by an elegance and a unique material, have amply demonstrated the greatness of the area and that of some of its best vineyards. Just think of plots now entered in the collective imagination, such as Rocca Bernarda, 10 hectares enjoying the influence of the sea and especially of large temperature changes between day and night, Buttrio, 5 hectares from which two of the most significant wines of Le Vigne di Zamò, the "Fifty years" or Rosazzo, 15 hectares characterized by a unique microclimate, fresh but at the same time temperate. Wines in perfect balance between tradition and modernity, produced in a suggestive cellar like few others, modern and buried in the hill so as not to impact the extraordinary environment that surrounds it.